Centre du Village. SKI, Dine, Danse, boutique, natation, tout à quelques pas de votre porte d'entrée. Parc dans le garage sécurisé chauffée et charger tout votre équipement sur un chariot et prendre l'ascenseur à l'étage de votre. Deux chambres avec roi, deux salles de bain complètes, et le salon séparant leur fournit le cadre idéal pour deux couples ou les familles. Le salon est ouvert sur la cuisine et la salle à manger et encadrée par étage à la paroi de plafond de fenêtres qui surplombe la station de ski et du lac. Il ya deux terrasses couvertes. Cette combinaison de condo Mountain a pour tous les goûts. De palpitantes courses avancé à débutant crusers amicales. combinée avec la locatation perfet dans le centre du village. Regardez les enfants sur la course depuis votre balcon tout en sirotant Hot Toddy de ... prendre la navette pour point de sable pour faire du shopping. Où vos pantoufles en bas de la barre de vin pour un plateau de fromages artisanaux et les viandes. Clearly the property needs updating along with furniture. The dining room table chairs are falling apart. The guest toilet doesn't work properly. The property says no pets, which is good because my son and I are allergic to dogs. Interesting we both were stuffed up the entire time and I noticed two doggie dishes under the sink when I took out the garbage - a little odd to have dog bowls in a condo that doesn't allow pets. Jeffery, I’m so sorry that my home was not what you expected. It is the first time that I have recieved a negative review . The white pine lodge does not allow renters to have pets in the building. Many owners ,as well as myself ,have pets. I have a small poodle named Jack, although he claims he is hypoallergenic, There are many furry friends that live in the building. Please be assured that if you had mentioned your specific sensitivity and concerns . I would of let you know. The slow flush in the quest bath could of been taken care of quickly. As soon as the cleaning crew noticed the issue maintence quickly addressed it and returned it to its full swooshing glory. Dated decor! ( I think I was just told I’m fat) .. and old. The table and chairs I think are so great. Well ...I’ll take a good look with your dramatic descriptions iin mind. Great View and Location for Ski resort. Everything was there . Restaurants , spa , ski chair . Best place for a wedding or family reunion , no one had to drive the whole time we were there. Condo was extra special because the view was spectacular . The bedding was extra nice . Will come back . This is a wonderful condo with spectacular views and stocked with everything you need! We stayed in this condo for a long weekend to attend a family "top of the mountain" snow wedding. We had several family members staying in various other hotels, townhomes and condos on the mountain and this condo was far and beyond the best! All our friends and family kept asking us how we got so lucky to get such a beautiful place. The owner Noele is very nice and was immediately available when texted. The condo is stocked with everything you need from plenty of towels down to a well stocked pantry with spices and staples. I highly recommend this condo and will definately rent again the next time I visit Schweitzer. This is a beautiful 2 bedroom, 2 bath property located right in the main village at Schweitzer. It has a gorgeous view overlooking the lake that is sure to impress. We had a family of 4 here, and there was plenty of room for all of us. It's right on the slope, so getting to the lifts is easy. Great location! We booked this condo for the MLK Day weekend in January and had a wonderful time. Speaking with Noele prior to the trip was easy and very helpful. She provided all the information we needed regarding the area and how to access the condo. Once we arrived at the condo we were very pleased with how nice it was kept. Everything worked great and the condo was overall in excellent condition. One thing of note was that both beds were very comfortable, in the past with condos we've booked we've had issues with this but not here. The first morning in the condo we were blown away by the amazing views this condo has. 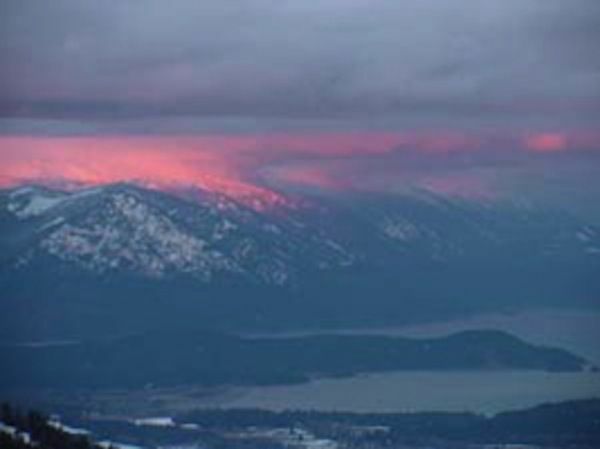 It overlooks the mountains and lake Pend Oreille combining for some beautiful landscape shots. The location was also great for getting to and from the slopes and made it very easy to stop and take a break or have lunch at the condo. Overall the condo is great and Noele does a great job handling everything you could need. I'd highly recommend this location for anyone interested in visiting Schweitzer. When I booked this condo, I knew the location was good, but walking into the place I was blown away by the view! Waking up to the million dollar view every morning was an amazing way to start the day! The location is so convientant, we were easily able to go to the condo and add more layers if it was cold, shed layers if it was hot, or just relax and have lunch in your own place. The condo was in excellent condition with very comfy beds, and the kitchen was fully stocked with dishes, pans, and utensils. It would've been nice to have paper towels, but really, that's my only complaint. Noele was easy to deal with. She made sure we had all the info we needed to check in, and didn't hit us with a ton of rules that some other owners do here on VRBO. I would highly recommend this condo! Situé dans le pavillon White Pine. Ski in / out. chauffées casiers garage de ski, du sol au plafond de mur de fenêtres pour profiter de la vue sur le lac. Deux chambres king séparés par Séjour avec deux bains parfait pour deux couples ou les familles.